We’re breaking new ground at BC Rockhound. I sent some Dallasite and Flowerstone to Tommy Lay, the best cabochon maker I’ve seen on the internet. Most people I’ve talked to about these rocks have not been very impressed. It blows my mind how few people have looked down on Vancouver Island and realized the bounty under their feet! I thought there must be something wrong with these rocks that makes them unsuitable for lapidary use, because I hardly saw any of it done, even locally. But my tumbles are coming out well in my opinion, and now I have some beauty validation in the form of cabochons! The first piece of Dallasite I’ve had cabbed. A stunning shield design by Tommy Lay. Boom. Dallasite is a very special rock to me. I had hung out at the private beach where I first found it often but never looked down. It was a cold winter, my business sense was tingling and a voice in my head was telling me there must be something valuable I could find for free. At first I picked up nice pieces of driftwood, which I still think is valuable to a degree, but it takes up a lot of space and is not really as satisfying or special. I can’t remember what compelled me to look down one rainy day at the beach but I remember noticing white rocks. I thought they must be quartz, and since quartz is one of the few rock names I knew at the time, I thought they could potentially be worth picking up. On that beach I went on to discover a lot of the white rocks were attached to black, green and brown bits. At first I thought those were undesirable parts, until I started noticing the patterns in them. I got home that night and stared into some of my finds. I knew they were special and valuable, at least to me. I’m a collector kind of guy and every rock is unique. It’s too addictive. I had a real spiritual connection with Dallasite. The rock grounded me and told me everything was going to be all right. I went on lots of hounding trips and did tons of internet research trying to grasp what rocks I had. The assortment of rocks on Vancouver Island is amazing and I still don’t know what some of the prettiest stuff is. Dallasite is like a brother to me now. Flowerstone I knew was special to my girlfriend and she had been wanting to find some since moving to the island. I was proud to find a bit of it and take her to find it too! Then I really did find a lot of it in one location, and that was my first real inland rockhounding find. 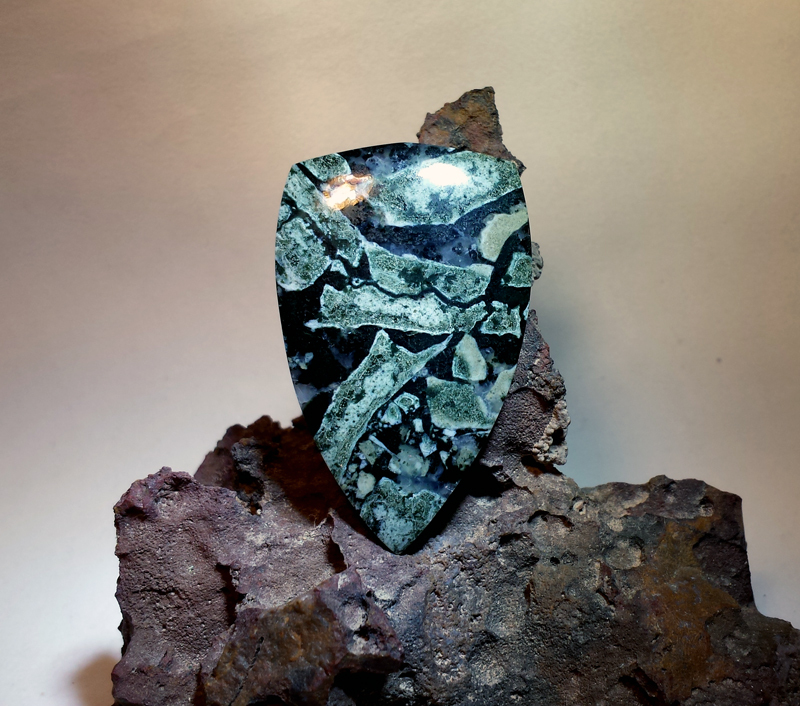 Beautiful Flowerstone cabochon from Tommy Lay, the first piece I self-collected and got worked by a professional. Excuse me while I’m buzzing and re-inspired to get tumbling done and a rock saw in my hands. 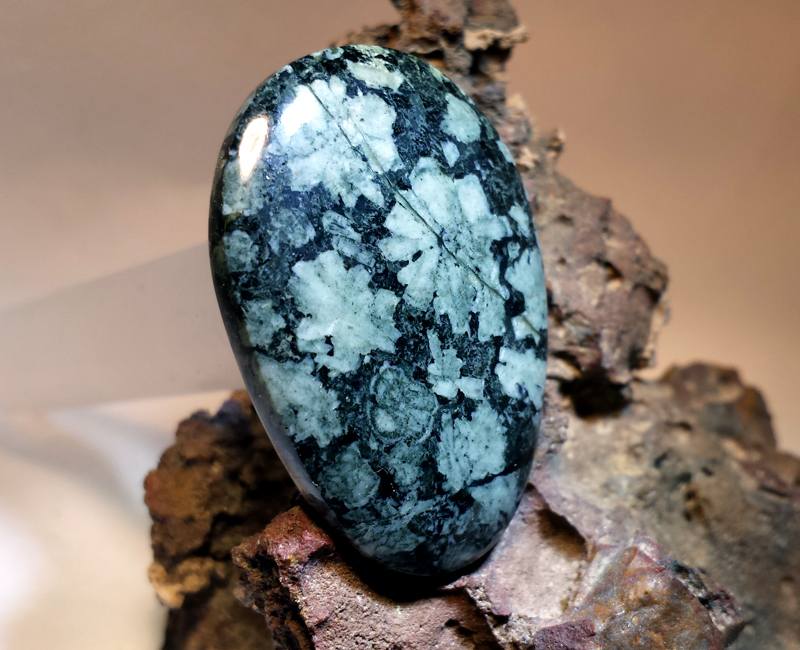 I will consider my job successful if Dallasite becomes well known in the lapidary community and Vancouver Island gets the recognition it deserves for being full of natural beauty. I had not heard of Dallasite before reading your blog. It is indeed a beautiful stone…thanks for sharing!